Miniature electrochemical gas sensors are a new low-cost, low-power and highly portable method to quantify pollution in the atmosphere. These tiny sensors (cm-sized, see photo) originate from industry where they are used in e.g. alarm systems for toxic gas release. Working alongside sensor technology company Alphasense Ltd, we have developed new methods to apply these sensors more quantitatively to measure the abundance of different gases in the atmosphere. Volcanoes are a perfect example of a strong gas emission source that cannot easily be reached using traditional instruments that are too heavy and too high-power, and that can only be partially characterised by remote sensing techniques or time-averaged gas-sampling followed by laboratory analysis. For this reason there is a growing interest in deploying portable instruments containing miniature gas sensors (called Multi-Gas or electronic nose) to characterise the emission composition. Our miniature gas sensor research has (i) widened the range of volcanic gases that can be detected by Multi-Gas (to include SO2, H2S, CO, H2, HCl) and (ii) developed new data analysis methods to improve measurement accuracy. Specifically we show the need for algorithms that account for transient sensor response in order to avoid measurement error and bias. The observed gas ratios (e.g. H2S/SO2, HCl/SO2) are interpreted in terms of subsurface processes (magma state), and combined with remote sensing of SO2 gas flux to yield overall fluxes to the atmosphere. Science aims in volcanology include to continuously measure emissions from a range of volcanoes to interpret composition changes in terms of degassing processes (towards improved prediction of volcano eruption hazards). An important atmospheric science goal is to trace compositional changes as the plume disperses in order to evaluate and improve models of the plume chemistry to better assess the downwind plume impacts on atmospheric composition, climate, ecosystems. Our ongoing research aims to further characterise the sensors and to include deployments on balloon and drone platforms for plume spatial mapping, applied at volcanoes and other pollution sources. We also active in public outreach, using the sensors with students during schools visits. Roberts T. J., Saffell J. R., Dawson D. H., Oppenheimer C., Lurton T., Electrochemical sensors applied to pollution monitoring: measurement error and gas ratio bias – a volcano plume case study, Journal of Volcanology and Geothermal Research, 281, 85–96, DOI:10.1016/j.jvolgeores.2014.02.023, 2014c. Roberts T.J., Braban C., Oppenheimer C., Martin R.S., Saffell J.R., Dawson D., Freshwater R.A., Griffiths, P.T., Jones R.L., ‘Electrochemical Sensing of Volcanic Plumes’, Chemical Geology, 332-333, 74–91, 2012. Top Left: Miniature (cm-sized) electrochemical sensor. 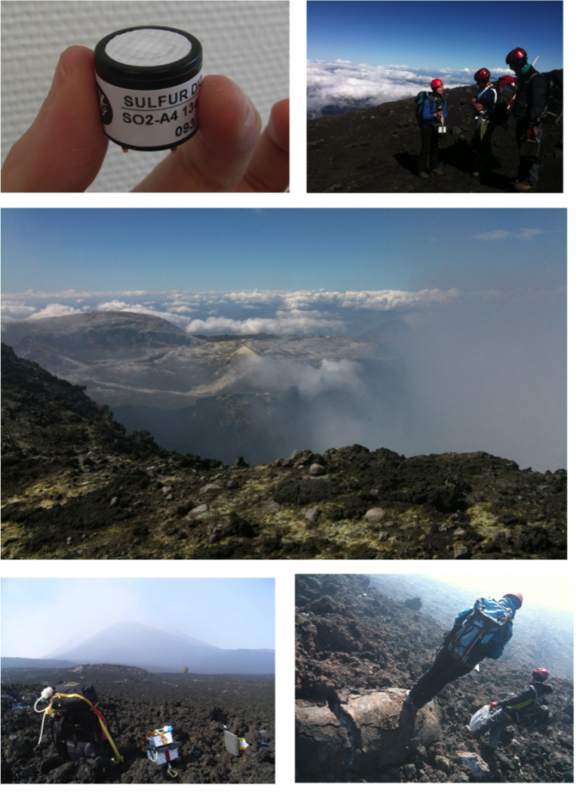 Top Right: ascent of Mt Etna, LPC2E and Italian colleagues (INGV) with Multi-Gas and aerosol instruments. Centre: view of the summit craters and emission plume. Lower Left: sampling of the grounding plume a few km downwind from Mt Etna summit. Lower Right: descent of Mt Etna by foot, over scoria and volcanic bombs.